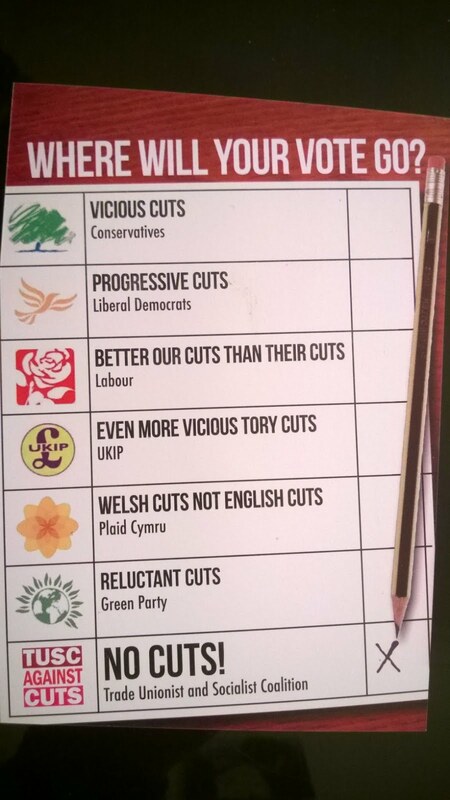 Swansea Trade Unionist and Socialist Coalition (TUSC): Vote for cuts or vote TUSC Against Cuts! 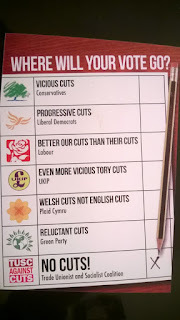 In Swansea West, like over 120 parliamentary constituencies where there are now TUSC prospective parliamentary candidates approved, voters can vote for cuts in a wide variety of party rosettes or they can vote for a clear no-cuts alternative - TUSC. The image for the latest TUSC leaflet says it all. We'll be distributing some of these at the Uplands market on Saturday (28 March). If you're sick of the cuts consensus and want to know more about TUSC, come and have a chat.